And with the launch of the new store, Paulina has a little gift for you! Pretty Pink Posh has a beautiful selection of ribbon, sequins, twine, confetti & more! Make sure you take advantage of the 10% discount!! Here's a card using Silver & Gold Flat Sequins and Gold Stars. It's a gray day here and I'm having a hard time catching the colors just right. Have fun shopping at Pretty Pink Posh!!!!! Love this, Mo! Those sequins are awesome. I love the flat ones and the stars!! This is such a fabulous card! Love that you've showcased how well sequins work on masculine cards. 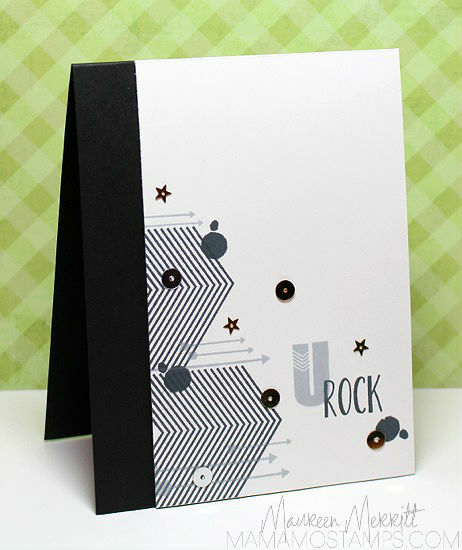 Great masculine card and the perfect sequins to match!! Love your fun modern design Maureen! Maureen...this card seriously rocks! So fabulous! Great card, Mo! I'm a day late and a dollar short! I placed an order Thursday at Pretty Pink Posh and it shipped yesterday! Can't wait to see those sequins! Super rock in' fun! You always rock those PTI stamps and the sequins are a perfect compliment! I love the little goodies from Pretty Pink Posh. :) You made a great masculine card here. The stamp set works really well with you sequins and your placement is spot-on.